Surrounded by metal scrapers and motorcycle workshops, yet packed with little old Chinese Thai ladies, I knew Su Ki Jeh Ru Yi Restaurant (สุกี้เจหรูยี่) was going to be bomb! The outside is painted a soothing turquoise and mustard green, and as you can see, it’s always a Happy New Year! 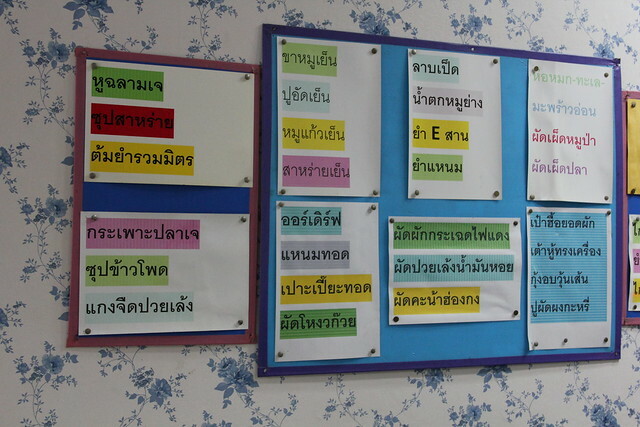 The menu was extensive and written in Thai, Chinese, and English along with neat little pictures to go with it. 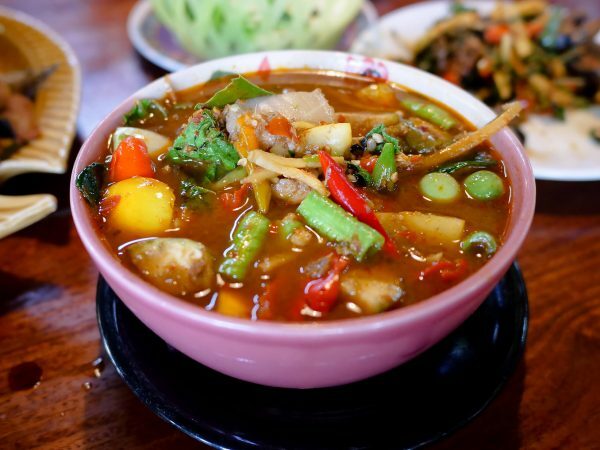 It’s one of those menus that made me excited and I immediately wanted to order many more dishes than I knew I could actually handle – and they are all vegetarian Thai dishes! 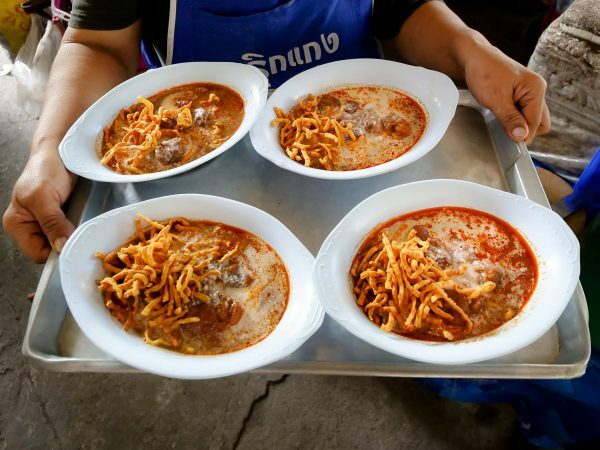 As I looked around the tiny restaurant, I noticed that most had ordered a bowl of tom yum, in some form or another. I took that as a hint to try the Kuay Teow Yom Yum (Thai Noodles with Spicy Soup). It was most excellent for a vegetarian version. 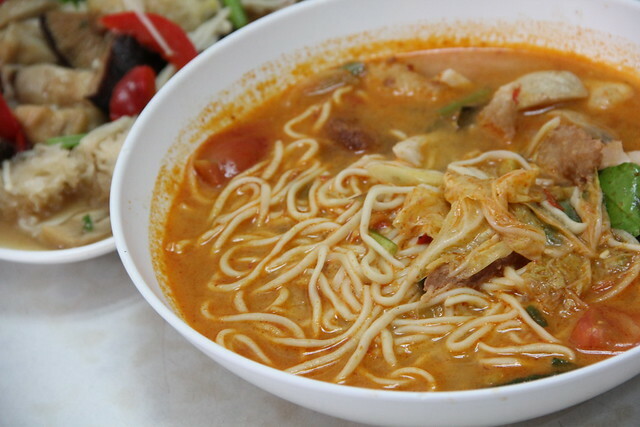 Nice and sour, lightly spicy, and just a tinge of creaminess to make rich soup broth. 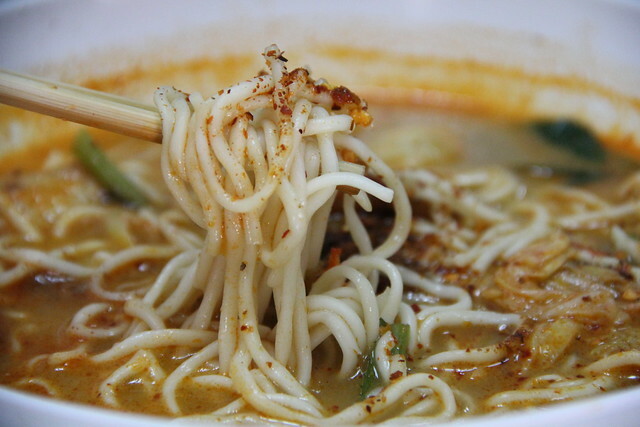 The noodles and other added fake meat ingredients acted to nicely soak up the delicious soup! 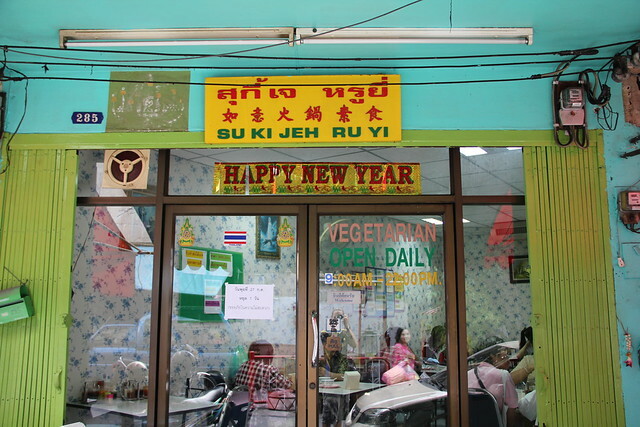 Inside of Su Ki Jeh Ru Yi Vegetarian Restaurant (สุกี้เจหรูยี่), it’s very small, only about 5 main tables. I actually had to share a table with a few elderly Chinese Thai ladies who were just sitting around drinking tea and enjoying themselves. This is a real Senior hangout spot! The cultural dining aspect reminded me a bit of eating Zanzibari Mix along with with a crew of elderly ladies in Dar Es Salaam, Tanzania. When I busted out the camera, they started smiling and asking me questions. When I wolfed down 3 dishes by myself, they started asking even more questions… They were all extremely nice! There are all kinds of colorful menu items and specials plastered on the walls. A couple of the ladies pointed out some of their favorites, but I have no idea what they are now. As a lover of mushrooms I had to order the Pad Het Ruam (mixed mushrooms). There must have been about 12 different kinds of mushrooms on this plate, it was like cubes of succulent steak. The final dish that caught my interest was this Khao Gaeng Gali (rice with yellow curry). At the time of ordering, I didn’t know that it would include a deep fried cutlet at the bottom (I try to avoid deep fried things, but every now and then I’ll go for it). I went for it this time and it was delicious. I honestly could have been fooled that this was a deep fried piece of some kind of meat. 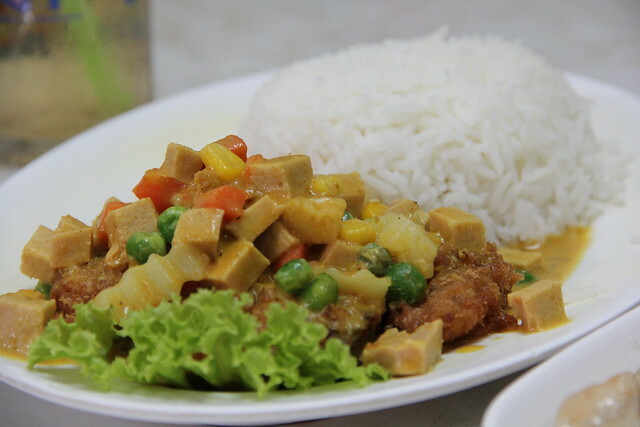 The heavy battered and deep fried cutlet covered in a mild yellow curry and served with rice was pretty tasty. It really reminded me of a Japanese curry katsu. 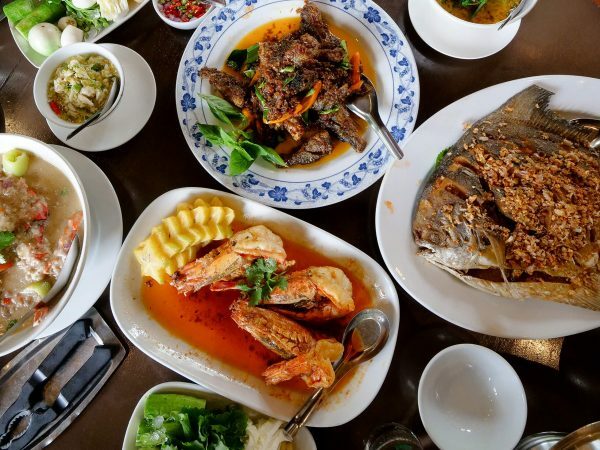 In a convenient location, just a 5 minute walk from Hua Lamphong, and with a smorgasbord of divine Thai Chinese all vegetarian food specialties, Su Ki Jeh Ru Yi is a Bangkok vegetarian cuisine powerhouse. It’s a real authentic experience and you’ll be surrounded by traditional elderly folks drinking tea. Prices: Meals range from 30 THB all the way to 200 THB, everything I ordered cost somewhere around 150 THB. 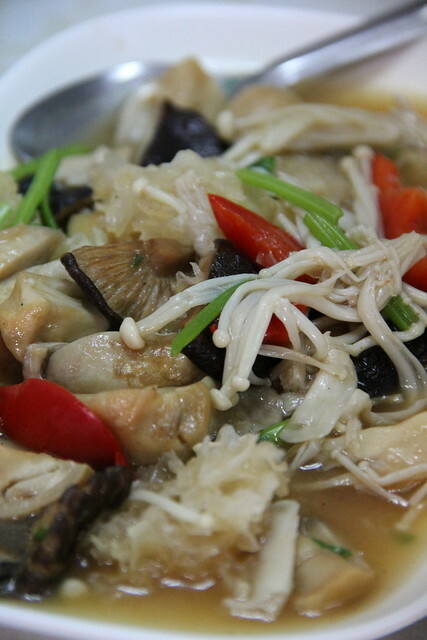 The restaurant is located right around the corner from the Hua Lamphong MRT station. Take exit #3 and head backwards, away from the train station to get to Soi Phraya Singhaseni. Then it’s just 50 meters down the road on your right hand side. We just went here tonight Mark! Thanks so much for posting this great review of this hidden gem! Would have never found this place without your research. Love your videos and blog! Wow, such a comprehensive list, so carefully made and organized, you must have put tons of work and time to build this up. Thank you so much for this, I’m a vegan starving in the Huang Lamphong station area, fortunally i bumped into this info and can finally get some warm food today. 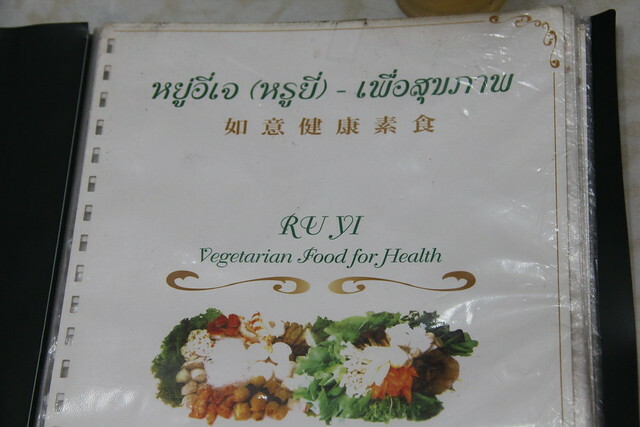 I’m starting to write a vegan’s world guide in Portuguese and this will be my starting point in Thailand. Hey Yara, glad you found this place. How did you like the food? 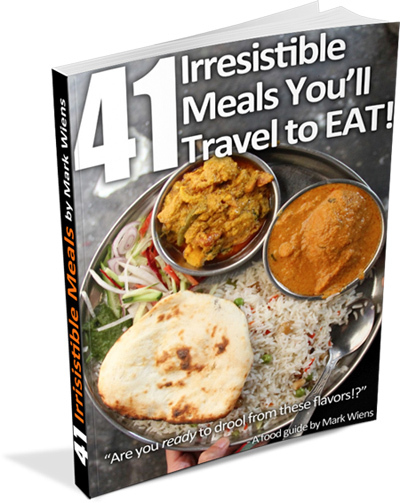 All the best with your vegan guide! I went there 2 times and its worth to go and very delicious, the price very cheap ! it is a good restaurant! Great to hear that Cherry, I haven’t been back in a while, so glad to hear it’s still as good as before! first of all thanks for that recommendation. It really is a great little restaurant and the food was fantastic! Just one correction: They do close at 9pm not 10pm! Thanks Daniela, I appreciate the updated information. Glad you enjoyed the food there! i am fr india.& coming to bkk. yr web site is great for vegi.foody like me. will love to meet u.& wish to give some indian veg.stuff fot taste,which u will never get chance to eat in bkk.pl rply me /or on my email yr contact no..
will be staying in bkk at sukumvit rd hotel. will reach bkk on 25th morn.pl rply. Wow Mark! I’m sitting here in cold Europe and can only READ about all that what I think is a real culinary delight. Thank you for your mouthwatering posts. Thanks for the comment Heinrich! Hope you can find some good food while you are in cold Europe too – and definitely make that list for next time you are in Bangkok!